Perhaps not as well known as later models, the Alfa Romeo 6C 1750 is one of the quintessential Alfa Romeos of its era. First introduced as a replacement for the 6C 1500 in 1929, the 6C 1750 evolved from a relatively simple road car to a very sophisticated racing machine in the five years it was produced. One of the key elements in the progress was designer Vittorio Jano, lured to Alfa Romeo from his former employer Fiat by Enzo Ferrari. Jano's first design for Alfa Romeo was the 6C 1500, which featured a small six cylinder engine with a single overhead camshaft. Competition versions of this relatively small Alfa Romeo were quite successful, with a highlighted victory in the 1928 running of the Mille Miglia. 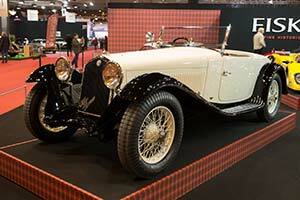 At the 1929 Rome Motorshow, the 6C 1750 was introduced. Technically it was almost identical to the 6C 1500, with the enlarged engine as the biggest difference. First and foremost the 6C 1750 was intended to carry larger and heavier fixed head bodies. The first model available, the Turismo, was equipped with a 3.1 metre wheelbase. Soon after a shorter wheelbase version, dubbed Sport, was launched. More importantly it was fitted with a double overhead camshaft engine, which would form the base for a series of very successful competition engines. The most powerful version was the Super Sport, which was fitted with a 95 bhp supercharged engine.